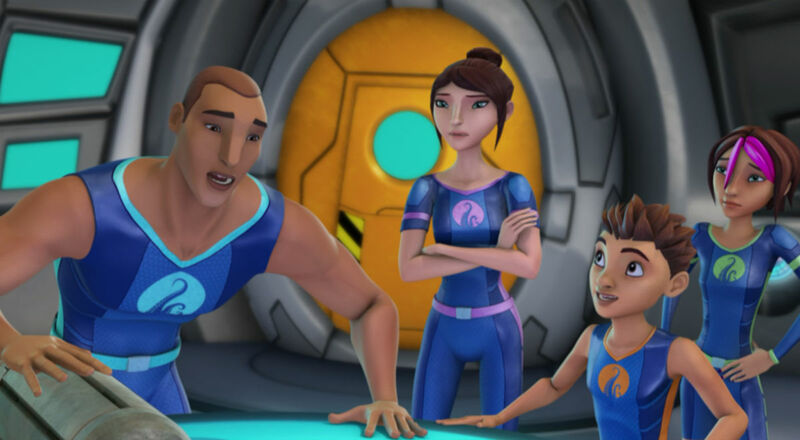 This week’s minorities in cartoons entry is “The Deep,” a CGI animated series. The series is based on a comic (of the same name) by Tom Taylor and James Brouwer. The family gets involved with various aquatic adventures across the world. Similar to the cast of “Wild Kratts,” the family all have a high degree of technology skills. Along with the above comes fighting several recurring villains. A running plot in the series involves the family trying to figure out the secret behind a cryptic ancient artifact. Antaeus (nicknamed “Ant”), a preteen boy who’s energetic about exploring the ocean, and is eager to try almost anything. Ant often totes about with him (in a modified aquatic backpack) a trained pet fish named Jeffery. Fontaine, a teenage girl who’s much more grounded than Ant. The kids’ parents, Will and Kaiko. Both are caring parents who’ve imparted their knowledge of the ship’s tech and oceanography to their kids. Will is Black, while Kaiko is Asian. “The Deep” is a joint Australian/Canadian production. As of this writing, one season of 26 episodes produced. The show debuted in December 2015 on 7Two, a secondary digital channel of Australia’s Seven Network. The series soon debuted in Canada on Family Chrgd, a secondary cable channel of Family. Most countries air “The Deep” on broadcast or cable/satellite TV. Here in the US, the series is only available on Netflix. Will is voiced by Michael Dobson, who’s done a variety of voicework. Never even heard of this show. The idea of a biracial family in which both parents are people of colour is rad, but I gotta say that those character designs are pretty ambiguous…I’d go so far as to say that both parents, particularly the mother, could easily pass for Caucasian if one wasn’t making a conscious effort to look for diversity. Just took a look at the comic’s artwork. Too bad the show didn’t make more of an effort to adhere to the original designs. The show’s designs remind me of something I heard someone say about the nondescript racial make-up of Naveen from “Princess and the Frog”, being “He’s light enough to be white, but dark enough to be not white”. Also, the parents in the book actually look like parents. Based on the header image, mom and dad in the show look like they could be the kids’ older siblings. I have been trying to discern the ethnicity of the Nekton family since I started watching The Deep. I am a 45yr old male fan that stumbled onto this awesome animated show by browsing Netflix. I couldn’t stand the taunting question any longer and finally decided to ‘google’ for the answer. It took quite a few tries before I came up with a query that revealed your blog. Thank God for your blog!!! Yaye!! And thank goodness for answering my question. It makes perfect sense. I of course looked at the facial features and color of each character. I was also trying to take in consideration the attempt the artist made to depict hair texture. The voice and physical features of Will, the father, made things pretty clear. But honestly, I couldn’t be sure about Kaiko, the mom. Then I came across your website … totally makes sense! Kaiko’s name brings more clarity! It also answers my curiosity regarding Ant’s coloring and facial features versus his, what appears to be, straight hair. Bi-racial. This makes so much sense now. Going back to enjoy more of The Deep now. But I will be back to check out more of your blog site!! ?